Zamzar is a free online web application to convert files like videos and music without downloading a software tool, which supports 1200+ file formats, more than any other converter. You are even able to copy the video URL for directly convert URL to MP3, MP4 nad any formats as you like. It's no doubt a superb file conversion online service. But converting videos with Zamzar also get you into trouble sometimes. For example, You can only download the converted video by email and must register to login for a comprehensive function with Zamzar. While there are many Zamzar alternatives or websites like Zamzar could get the same effect of converting videos but free from the troublesome converting process. Best alternative to Zamzar to download online videos free from YouTube, Dailymotion, FB, and 1000+ movie sharing sites and convert videos to MP4, MOV, 3GP, FLV, iPhone X/8/7/6s/6/Plus, iPad Pro/mini 4, etc. with no adware, malware. Why do you want to ditch away Zamzar? Despite Zamzar incorporates many distinctive features, you will still want some similar sites or Zamzar alternatives due to some drawbacks listed below. 1. Ask for email address. You must fill in your email address to receive the converted videos or files every time, and then take an extra step to download the converted videos by email. 2. Limited files size. If you are a visitor of Zamzar, only videos less than 100M are allowed to convert, unlike other video converters without limitation of video size. If you want to convert lager files, you must register to be a member of this site. 3. Member registration. Only be a member of the Zamzar, can you get a faster download speed, convert larger files, jump to the front of the queue, and convert videos in batches. 4. Ads and virus. It a common failing of online video converter. It appears ads more or less and even virus sometimes. 5. Limited URL conversion. It does convert videos with URLs from many video sharing sites like Dailymotion, Myspace, Google Video, Metacafe and so on. But it's unavailable for YouTube, Facebook etc., which are more popular for users. Copy and paste the video URL from Zamzar supported websites > Choose the output format > Enter the email address to receive converted video > Start convert > Download converted video by email. 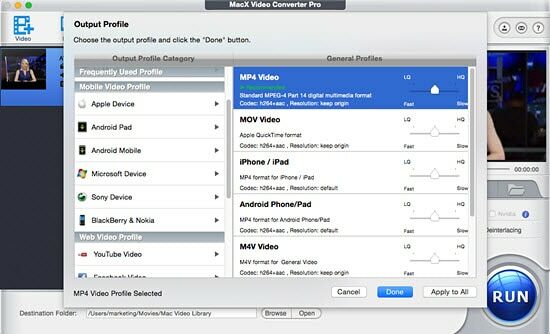 MacX Video Converter Pro is more favoured for faster speed and originally quality. It is capable of download video to MP4, MOV, AVI, FLV, 720P, 1080P HD from YouTube, Facebook, Dailymotion (1000 sites). With 420+ preset profiles, videos can be converted directly to iPhone X/8/7, iPad Pro, iPad Mini, Galaxy S8, etc. By the way, if you precisely encode video to HEVC or H264, you are granted to enjoy a super fast process of video conversion. 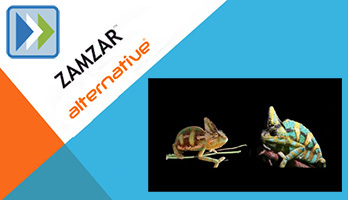 This Zamzar replacement latest version has a fresh technology called Intel QSV/Nvidia/AMD hardware acceleration, enabling you to convert the HD video in 2-3 times faster speed than older version and 5x faster than other video converters. 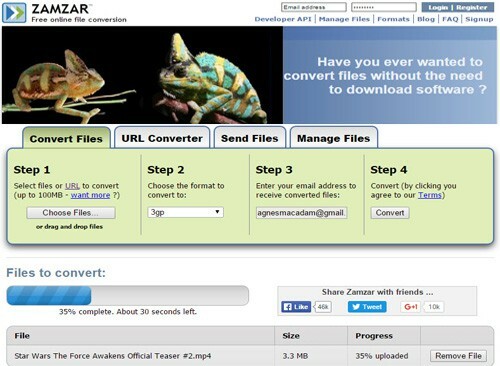 1Free download the Zamzar conversion alternative and run it on your computer. Click "Add Files" button to import the video to be converted. 2Choose the output format from the automatically popped-up window. Click "General Profiles" to find out the final output format. Or choose the specific mobile device for the video. 3Click "Browse" button to specify the output path for saving the converted video with the Zamzar alternative. 4Hit "RUN" button to start the super fast video converting process.